When to use: When the market is either below A or above C and position is overpriced with a month or so left. Or when only a few weeks are left, market is near B, and you expect an imminent move in either direction. Profit characteristics: Maximum profit equals the credit at which spread is established. Occurs when market, at expiration, is below A or above C, thus making all options in-the-money or all options out-of-the-money. Loss characteristics: Maximum loss occurs if market is at B at expiration. Amount of that loss is B – A – credit received when setting up position. Break-evens are at A + initial credit and C – initial credit. 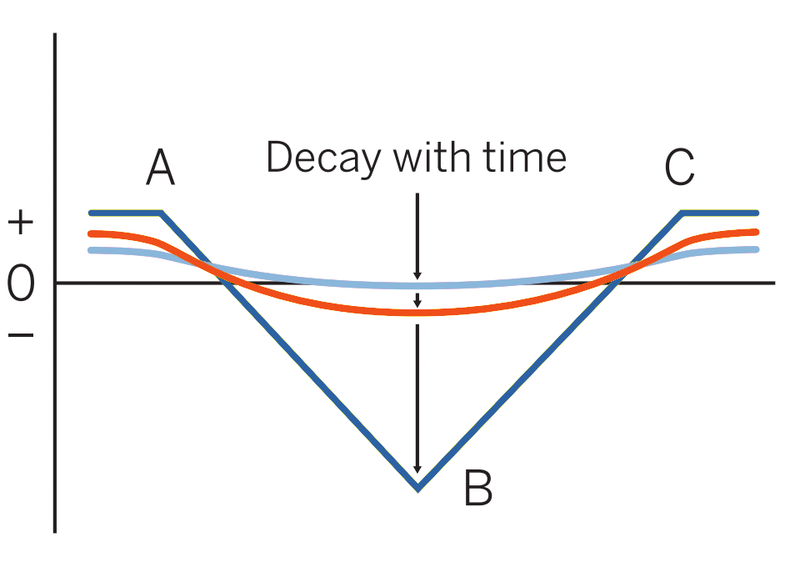 Decay characteristics: Decay negligible until final month, during which distinctive pattern of butterfly forms. Maximum loss acceleration is at B. 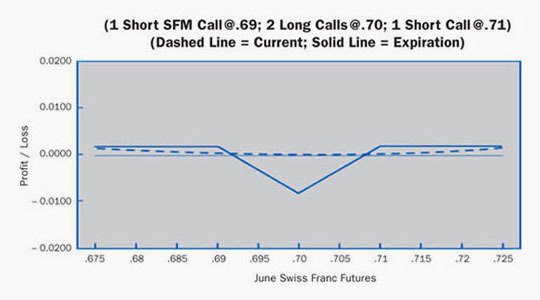 This trader currently has a #19 Call Ratio Backspread, but now feels that the underlying futures will not explode on the upside. Instead, the trader feels that the market has an equal chance of going up or down, and thus converts the position into a short butterfly. Breakeven:Downside: 0.6924 (0.6900 strike + 0.0024 credit). Upside: 0.7076 (0.7100 strike – 0.0024 credit). Loss Risk: Losses bottom at 0.7000 strike. Maximum loss of 0.0076 ($950). Potential Gain: Gains top out at original net credit of 0.0024 ($300). This occurs when futures rise above 0.7100 strike, or fall below 0.6900 strike. There is not much risk in this position. Volatility has little effect. You should avoid follow-up strategies unless you are quite certain of a particular move. Nearly every follow-up to this strategy requires more than one trade—possibly incurring large transaction costs.